League leaders Chelsea take on Norwich City in the warmth of the bright sunshine that usually wraps Stamford Bridge for a Saturday afternoon game. The European Championsai??i?? 0 ai??i?? 4 result away from home in the Champions League was rather flattering as Nordsjealland almost managed to punish theAi??BluesAi? ?by sticking to their guns and playing their brand of attractive, pass and move football. Chelsea could only manage a 1 ai??i?? 0 against Stoke City after their European game against Juventus that ended 2 ai??i?? 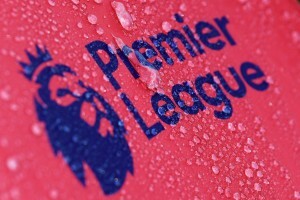 2 and it remains to be seen how well the team do this weekend; as there could be a few tired legs in the Chelsea ranks. On the positive side, Chelsea are going to be in a buoyant mood, thanks to their position in the table and will want to make the most out of a routine home game. Confidence is also bolstered by the fact that the team beat Arsenal last weekend in what was their first big test of the season. And of course, it is still very early to be looking at the table for clear cut indications, but Chelsea would want to take advantage of Unitedai??i? ?s loss last week against Spurs and Cityai??i? ?s slow start to the season. Manchester United in particular have a tough outing against Newcastle at St.Jamesai??i?? Park in what will be the final fixture of the weekend. That makes it a chance for theAi??BluesAi? ?to pile on some pressure then before the footballing world braces itself for the upcoming two week international break. By contrast, Norwich City lie 18thAi? ?in the table with just three points after the opening six games. TheAi??Canariesai??i??Ai? ?fixture list has been a testy one. Chris Hughtonai??i? ?s team have faced Fulham, QPR, Tottenham, West Ham, Newcastle and Liverpool so far. To be fair to them, they have managed draws against QPR, Tottenham and West Ham this season. Also interesting to note that all of the three are London based teams. They did lose 0 ai??i?? 5 to Fulham on opening day though. It does not get any better for Norwich as they have some incredibly tough fixtures coming up right until the end of November. Teams in a relegation fight normally relish denying the biggies a win, and Norwich wonai??i? ?t be any different. There will be sufficient motivation for theAi??CanariesAi? ?to make it extremely hard for Chelsea. There is a parallel side show for the Norwich faithful and for those others interested ai??i?? Former manager Paul Lambert is apparently suing the club to the tune of about A?2m. Why, we donai??i? ?t know yet. Chelsea have nothing ai???newai??i?? to report on the injury front, but Marko Marin and Daniel Sturridgeai??i? ?s return still remains a mystery. Marin was with the team in Denmark and did train, but Di Matteoai??i? ?s presser post training on Friday should reveal further progress on the duo. These games provide the Chelsea boss with a chance to rotate however and that brings us to Branislav Ivanovic, who isnai??i? ?t in the best of form for Chelsea at the moment but has played every game barring against Wolverhampton in the Carling Cup. So will Cesar Azpilicueta earn his first Premier League start/appearance come the weekend? Ashley Cole is another player who has virtually played every game, but heai??i? ?s unlikely to be rested at this juncture of the season. Captain John Terry will come back into the set up after sitting out for the midweek game against Nordsjaelland. Midfield will most likely see Frank Lampard and John Obi Mikel play with the trio of Oscar, Hazard and Mata supporting Torres upfront. Ramires is likely to be rested as the Brazilian has relentlessly played every game barring the opening day 0 ai??i?? 2 win against Wigan ai??i?? a game he missed due to illness. Starting Line Up ai??i?? Cech, Ivanovic, Luiz, Terry, Cole, Mikel, Lampard, Oscar, Hazard, Mata, Torres. Norwich are sweating over the fitness of Sebastien Bassong and Anthony Pilkington who is out with a back problem. Bassong however, is expected to be fit in time for kick off. Both Steven Whittaker and Simon Lappin are likely to be out for this game with ankle injuries, while striker Harry Kane has had surgery on a foot injury. It wonai??i? ?t be surprising if Chris Hughton decides to go ahead with a change in midfield to address his teamai??i? ?s current plight. Norwich are largely expected to line up in a 4 ai??i?? 4 ai??i?? 1 ai??i?? 1 formation with main man Grant Holt upfront. New recruit Alexander Tettey could get a start alongside David Fox in midfield while midfielder Wes Hoolahan plays behind Holt. 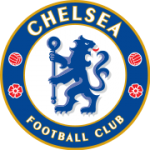 Chelsea are likely to keep possession and try to open Norwich City up, which makes it a fairly straightforward challenge for the visiting side tactically. The agenda is likely to be focused on keeping shape and hitting Chelsea on the break. The Stamford Bridge side have looked vulnerable to the counter on occasion and striker Grant Holt would have to make the most of any opportunity that he might get. Profligacy in front of goal will prove very costly for Norwich. Starting Line up ai??i?? Ruddy, Martin, R.Benett, Bassong, Garrido, Tettey, Fox, E.Benett, Hoolahan, Pilkington, Holt. Norwich City did take a point off the Blues at Carrow Road last season, and performed well with 10-men in a 3-1 defeat at Stamford Bridge last August. Norwich have the edge on Chelsea in terms of all-time wins in the league, winning 12 to the Bluesai??i?? 11. Norwich have not managed a clean sheet in any of their last 36 top-flight away games – a Premier League record. Juan Mata ai??i?? Rejuvenated after his two week break, the Chelsea man has created three and scored four goals in the last two weeks for Chelsea. While his overall play is yet to peak, Juan Mata still has enough about him to make a telling contribution when needed. Besides, Norwich City do provide him with a happy memory as the Spaniard scored his first goal for Chelsea at Stamford Bridge after coming on to make his debut under Andre Villas Boas. With John Terry coming back into the set up for Chelsea and with Petr Cech in good form as per usual, it is difficult to see Chelsea conceding a goal. However, their vulnerability to the counter attack means that Norwich could just cause Chelsea some trouble from time to time. On the attacking front, Chelsea are extremely well stocked and Di Matteo will not hesitate to use his vast resources in his quest for a win. Chelsea will be desperate to head off into the international break with that winning feeling and will take nothing less than a win at home. Chelsea vs Norwich City Highlights 2011 from Mark Asato on Vimeo. Norwich cannot beat chelsea is biggest team in world. Chelsea are in good form this season,so I believe that chelsea will try all their possible best to overcome norwich city. chelsea is the best team of the world. i’m sure even if they play chelsea 10 vs norwich 11 chelsea will win the game by 5 – 0 remember uefa championsleague semi final against barcelona. 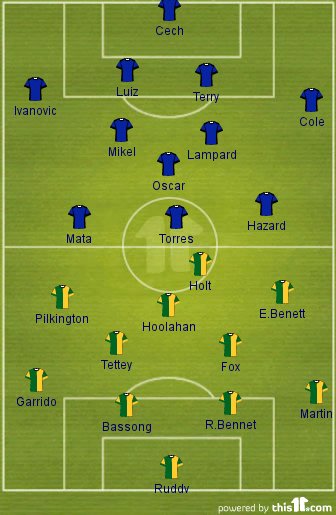 chelsea will win norwich 4-0 and the goal of the week will be awarded to chelsea.